During the last few frenzied weeks of the academic semester last month I came across an article I reviewed quickly and put aside, but which has lingered in the back of my mind despite the fact that I can’t seem to find it again. Essentially, as a I recall, the article addressed the manner in which academic (and school?) libraries are evolving more fully into social spaces for students, along the lines of a second student union or a glorified internet cafe. The article raised the question in my mind of whether libraries, if they continue to progress in this direction, will eventually just merge into the campus student union, which also provides computers, study spaces, and food options. Do we have a greater vision, a plan for where we’re going, or are we just rolling with the times? I spent a lot of time last fall researching an annotated bibliography on the Learning Commons that caused me to reflect on some of the same questions. In 1985 Pat Molholt published an article in the Journal of Academic Librarianship titled “On Converging Paths” in which she suggested that libraries and computer labs were likely to merge into one. At this point we can say that she was partially correct, as the job description of a librarian now overlaps strongly in many ways with an information technology job description (I am not sure the reverse is true, however). As a reference librarian, I probably spend about the same amount of time helping students with research as I do helping them with technology. At many institutions the relationship between the library and IT department are very close, and they often reside in nearby office spaces, but I am not aware of any place where they have yet been merged. The idea of combining libraries with information technology departments is scary to many, but also a very natural step. Many libraries have their own IT departments, or rely heavily on an organizational unit to build and update their website, keep online resources correctly linked and current, provide online reference services and technology support for patrons, and host multimedia content, among other things. If librarians were more highly trained in back-end technology, think of how much further we could take many of our instructional and service initiatives! If IT professionals were trained as librarians, the same would be true. If you’re not familiar with the concept, the Learning Commons is the latest manifestation of the 1990’s Information Commons, which was a later manifestation of the 1980’s library computer lab. First we put computers in libraries and thought that was pretty cool. Later, libraries at some notable institutions such as The University of Iowa and The University of Arizona decided to integrate their computer labs more fully by expanding the labs, providing a greater variety of software and hardware, offering combined research and technology help desks, and building computer classrooms where online research skills could be taught. That was the Information Commons. More recently, a number of universities are beginning to build on the Information Commons concept with the goal of a “seamless learning environment” in mind. The Learning Commons includes, in addition to the usual computer labs and classrooms, student services resources such as the writing center, career services, and residence life. In some cases these are physical facilities that combine several units, in other cases they are programmatic or service collaborations (If you’re interested in learning more about this, try Learning Commons: Evolution and Collaborative Essentials or any of the other recent books on the topic). Apparently, this is the next step in our evolution: it’s like creating the WalMart of libraries where students can do their one-stop shopping for everything college. I think this is a really interesting direction, and I’m sure many of the Learning Commons will be (and continue to be) highly successful. The goal of the Learning Commons is to identify the ways students learn today and creative a responsive environment for them. But it makes me wonder what our libraries and our jobs as librarians will look like in the future if we continue to change in the direction of merging our buildings and services with everyone else’s buildings and services. Will we even call libraries “libraries” then, or will we have more elusive names such as “Integrated Services Building”? At the ISB you can grab a cup of coffee, research and write a paper, troubleshoot your registration problems, and sign up for the dorm room lottery. I wonder if it will be the same person who can help students with all those things. And the most important question of all: do we know where we’re going? It raises the question–-what makes a library a library? And not just because there aren’t live staff there. There is not a full browsing collection of materials, no internet-enabled computers, no wifi, no rooms to read or study in, no programs, etc. From her comment we might extrapolate that what makes a library a library are the things she listed: librarians and staff, a large collection, computers and internet access, study space, and programs of some variety. But a few days later, a set of video interviews published by Buffy Hamilton from Creekview High School in Canton, Georgia, seem to disagree, at least from the teen perspective. These young people generally see the library as a place to both hang out with friends and get their work done. Out of the twelve students she interviewed (she notes eleven, but one video clip has two students), I was surprised to see that nearly half, or five students, cited “atmosphere” as what makes a library a library. What constitutes the library atmosphere was unclear. The library is the only centralized location where new and emerging information technologies can be combined with traditional knowledge resources in a user-focused, service-rich environment that supports today’s social and educational patterns of learning, teaching, and research. Whereas the Internet has tended to isolate people, the library, as a physical place, has done just the opposite (p.3). The library as a place that counteracts the isolating nature of the internet is something I can get on board with. And again, it reinforces the idea of the library as an increasingly social venue. The value of the library as place appears to be alive and well, but what kind of “place” are we talking about? It seems important that we retain the “atmosphere” the interviewed students cite, but first we need to know what that atmosphere is. If our libraries morph into something else by blending with other campus entities, the qualities students enjoy might disappear. On the other hand, perhaps those qualities are so central to the library that they will persist regardless. Vision: Do We Have It? 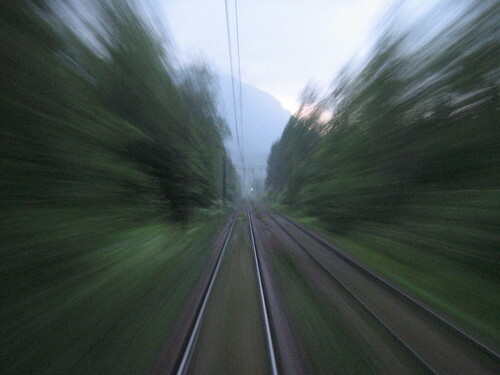 Being a librarian these days sometimes feels like being a passenger on a fast-moving train. We sit inside, hoping there is someone in front running the show, or hoping at a minimum that another train won’t run us off the track. But we sit looking out the side windows without having any idea what may be coming along the road in front of us. Whether or not anyone’s in charge, it can be hard to tell. Lots of people have taken stabs at predicting the future of libraries, and I can’t say with any authority (until we get there!) whether they have it right. Will we be cultural centers, wholly special collections, digital repositories, absorbed into Google, or just plain out of business? Out of curiosity I searched the last six years of the journal Library Administration & Management for articles with “future” in the title, and found only five. Two were a two-part article on the future of libraries by Bonnie A. Osif from 2008 that summarized the variety of perspectives about library futures as represented in the literature. I must admit to being surprised to not see something more visionary in this journal. Perhaps I am looking in the wrong place. But it seems to me, and I don’t mean to criticize any of our great library leaders, that most of the “vision” I see in the library field is just an expansion of what already exists. Building on our strengths is a great thing, but it is a different thing than having a vision towards which to build our future. Who is our Henry Ford, our Steve Jobs? Who is leading us to a place where libraries will thrive and succeed in an uncertain future? Some may argue that we don’t need visionaries to lead us, but I disagree. Most of us work day to day with our heads down, just trying to get everything done. We need leaders who have the time and space to be constantly looking ahead, watching the clouds, and anticipating the storms and sunshine to come. I don’t have the answers — only a lot of questions. It seems to me that the first thing to ask is what we want libraries to be in the future. Or would it be better phrased to ask what our students want libraries to be in the future? Do we serve our students best if we turn libraries into learning centers combined with various other campus units? From my admittedly inexperienced perspective, and considering the state of the economy, I can see this road leading us towards a place of campus mergers. Putting our instinct for self-preservation aside, is an eventual merger of the library, IT department, and (potentially) other offices desirable? Students might love it, as it will avoid their being redirected multiple times to the office that “handles that,” but will it be the best way to serve their information needs? Of course we must balance what we want for libraries with what is possible, considering the changes in technology and learning that are still happening. We can’t predict where learning theory may take us next, but I learned while at The University of Arizona that sitting around and waiting for the future to take us somewhere is an exercise in failure. Peter Drucker and other great management gurus encourage us to take control of our future by constantly assessing our successes and failures, experimenting with new innovations, and shedding those aspects of our work that don’t measure up. I like to consider what our libraries would look like if we tore them all down, erased our memories, and rebuilt them from the ground up. No doubt we would focus first on what our patrons need and use. Not books, that’s for sure — forget about print. Computers and software, yes, but everything will have to be wireless so buy up those laptops. Online resources for sure, but reconfigured in simpler ways. We may still buy academic databases, but now that we’re cross-trained as IT specialists we’ll build our own search engines that cross all of our various information platforms seamlessly. Our buildings will be full of flexible social spaces that can be used for teaching, gaming, group work, and just hanging out with friends. We’re not going to design around the needs of computers anymore. We’ll share building space with the writing center, coffee shop, tutoring, business center, and maybe others. Perhaps we’ll be a big educational mall. WalLibrary. LibraryMart. Overall, our libraries are innovative and ever seeking improvement, but let’s face it: we’re turtles among a race of hares when it comes to moving with the times. We grab onto new technologies eagerly, but don’t know what to do with them or how to use them effectively. We’re just starting to understand that assessment is important. If we’re honest with ourselves, we know that as a whole we move too slowly. And while it may get us somewhere faster, riding along in somebody else’s train may or may not take us where we want to be. Who are our visionaries, who is leading this charge of libraries into the future? I’m really asking you, ItLwtLP reader, because I don’t know. I would love to hear about your vision and those you think visionary in the comments below. Perhaps if we put our heads together, we’ll start to see a little glimmer of what’s down the road for us. Thanks to Ellie Collier, Emily Ford, and Tom Hillard for offering feedback on a draft of this post. I’d like to think that no matter what shape our future libraries take or how they evolve, that design will be an important process that we use to take us there. Over at Designing Better Libraries I try to share ideas on how this might work, and why design could help us to create a better library user experience. Technology will always be important as a foundation for a strong library, as are the right books and digital content for a strong collection, but what ultimately matters in my vision for future libraries is the relationships that we establish with the members of the user community. Information is increasingly commoditized and undifferentiated, so we have to ask why people will use libraries in the future – and what could we do to make libraries unique and more valuable to people. If we can’t answer those questions we may not have much of a future. So any vision needs to emphasize, I think, the important of the relationships you can build with librarians. I am not so worried about who is coming forward with a vision for the future of libraries. I do think it is critically important for librarians, perhaps with direction from the leadership, to develop a sensible vision for their library that reflects the expectations and needs of their user community – but also delivers unexpected and memorable experiences. Each library and its community are so unique in ways that a single, central vision for this profession may not be possible. If each library can create a good vision for its future, that will only help to strengthen the entire enterprise. In some recent presentations I have been speaking about the concept of library fitness and how a fit library is a future proofed library. Just as achieving personal fitness is a goal for a longer life, achieving library fitness is a strategy for organizational sustainability. I think there are some very basic strategies we can use to achieve library fitness (which I share in the talk – and in an article that should be published later this year). One person who I do think has offered some visionary ideas for the profession is David Lankes. You may want to take a look at his blog and some of his projects. You’re obviously American librarians – in a lot of UK universities, library and computing services have been merged for 10 years or more as Learning Resources Centres. Obviously there are still challenges for the future, but we need to be thinking about how we are going to provide information to our users rather than worrying about preserving “the library”. Terrific post! All the right observations & questions, just the right tone. Thanks, Kim. Thanks Kim. I do think as technology is becoming more integrated into so many aspects of our society it does our users a disservice to claim “that’s not our department.” I see technology training and libraries as an excellent fit segueing smoothly into other information literacy topics. I also see many bewildered students wandering in to the library unsure how to proceed with all of the online forms they need to fill out and unsure where to go for help. Our school has a phone hotline, but no in person help available. If they don’t have the skills to fill out their financial aid form or sign up for their student email account, how can I teach them how to navigate our library resources? There’s a quote I love that I’ve heard a number of times at my institution, you have to teach the students you have, not the ones you wish you had. So I think finding out what our users need and want from us is a very important step in the process, as well as whether or not it’s something we can reasonably provide. I am the sole library staff at a young and growing university, and the library was part of the Office of Information Services for the first 5 or so years of the university’s history. This worked because the CIO was a librarian. In addition to the CIO and the University Librarian, there were 5 other IT staff in the Office of Information Services. Recently there has been a reorganization. Now my job title is University Librarian and Director of Student Services, and I no longer am in the Office of Information Services. I miss it, and think that as a librarian, I brought a unique perspective to IT and served as a bridge between the user and the technology. Who knows what the future will bring? I’m still trying to keep a close relationship with my IT colleagues, and am now learning the business of student services. Excellent article! I teach leadership courses for a post secondary in Canada and you have incredible insight into the fundamentals of leadership. Thought provoking, no doubt.All confusions & misubnderstandings will disappear once we realize well what a library is? It is an institution that has come into existence long long ago to link the user to information sources, whatever the format. It also used to shoulder the responsibility of preserving for posterity these information sources. But later,with the classification of libraries into different types,this job was entrusted to a particular type of library and others were absolved of this responsibility.We began with clay tablets as records or sources of information, continued with parchment, leaves etc and finally had the print on paper. And, now we have digital resources, available physically in electronic format or accessible remotely as cyber resource. Librarian’s job continues to provide the connection. Of course in this new/emerging information landscape we have to have new operatiions to provide access and also remodel our services. But the job is the same. Definition, aims and objectives and purpose remain unchanged.Myh concept of a library simply is: a place where information sources are organised for use.